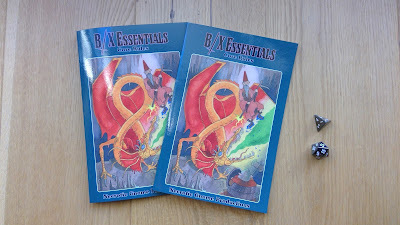 One Sunday in August, I announced the second book in the B/X Essentials line: Classes and Equipment. Since then, a huge amount of progress has been made on the book. 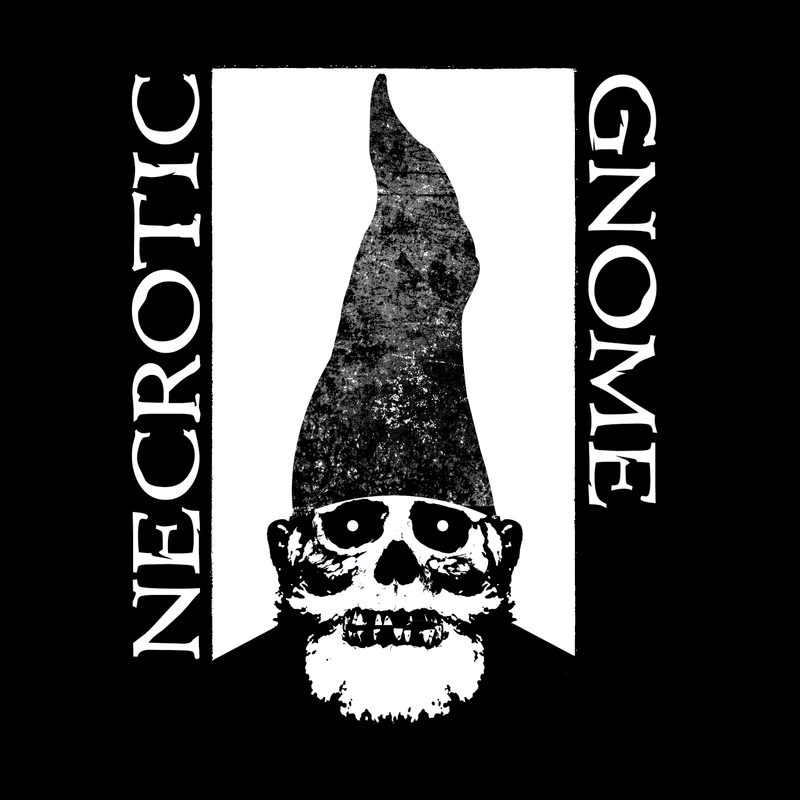 The draft text has been finished, various people have been helping out proofreading it, and I'm now most of the way through getting the text into its final form. Look at the dwarf class. Seems simple enough, right? 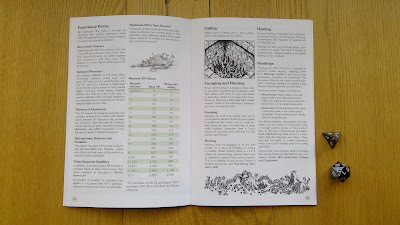 But then look at where the information is collated from. The main class description is on B9. The XP and HD advancement table for levels 1-3 is on B8. Of course, the chart for advancement beyond 3rd level is on X5. Then the description of the class features for levels 3-14 is on X7. Then you have the table for saving throws on X24 and the attack table on X26. And then the dwarf's ability at finding traps is hidden away on B22. And the rule about dwarves and other demi-humans having an improved chance when listening at doors on B21. That's a lot of really scattered information, right? 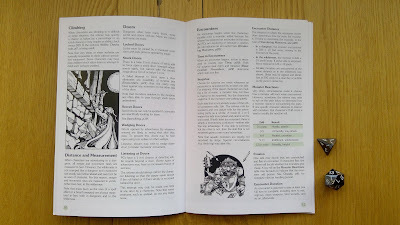 My layout aim for the character classes in this book will be to present everything relating to each class together in one place, on a single page or spread. Look at the weapons table. A simple thing, but it collates all the information from B20, B27, X9, and X25. As is doubtless clear, I love B/X, but honestly, the information about sea vessels in the Expert book is really awfully presented and appears to have not been proofread. 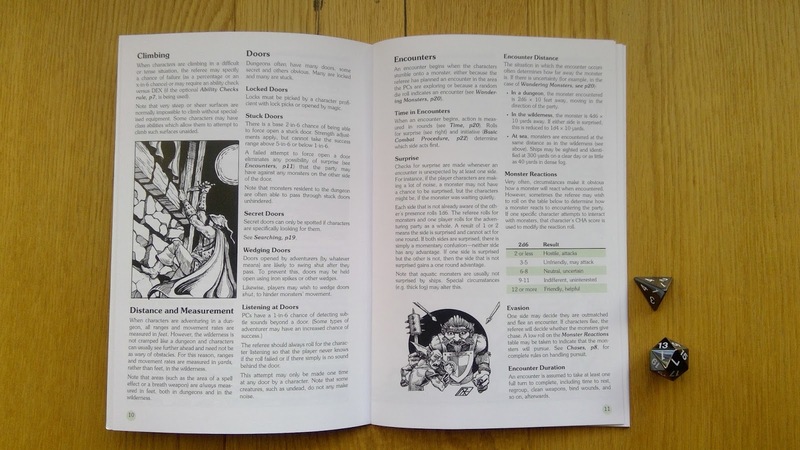 B/X Essentials: Core Rules -- Print Editions Available Now! The first book in the B/X Essentials line is now available to buy as a print / PDF combo at RPGNow (and pals)! Premium edition. Staple bound (lays flat on the table! 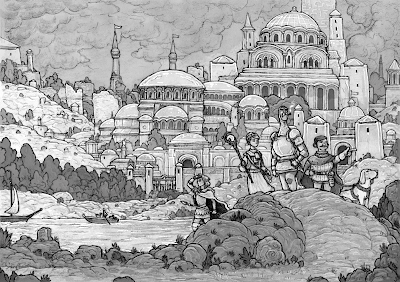 ), 6" x 9", premium colour. Standard edition. Perfect bound, 6" x 9", standard colour. The premium edition is (obviously) the fancier of the two. The binding means it's able to lay flat on the table, which is great for use during play. The premium printing also means that the text and illustrations are just that bit crisper. That said, the perfect bound edition looks great too and is a bit cheaper. 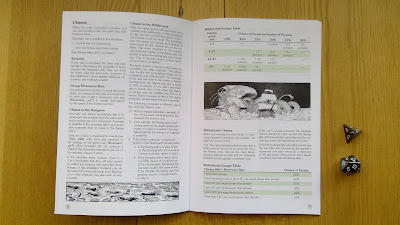 And here are a few interior shots of the premium / staple bound edition. All the XP rules on the left-hand page. All the encounter rules on the right-hand page here. 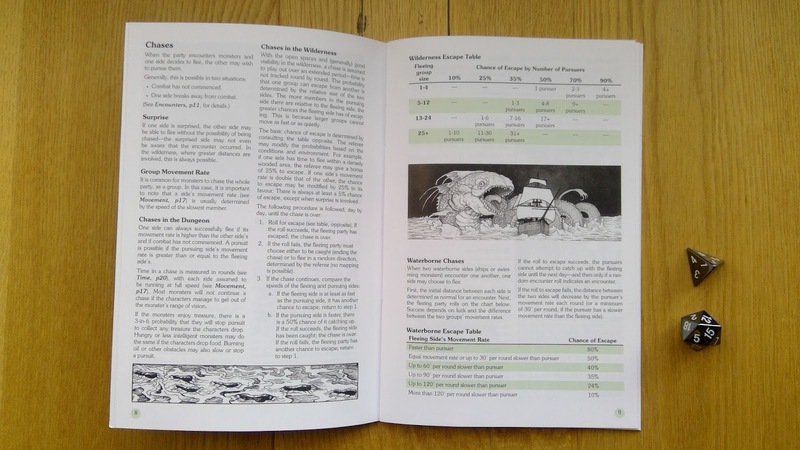 Rules for chases in dungeons, wilderness, and at sea, all on one spread. 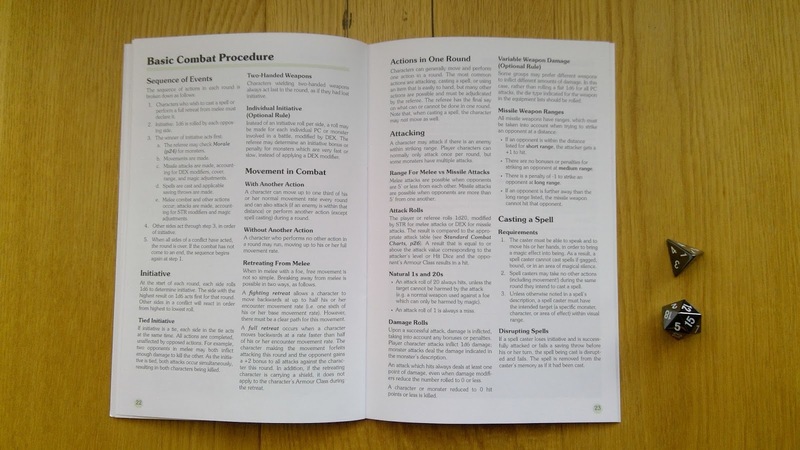 All the basic combat rules on one spread. People who have already bought the PDF edition: I've sent out a coupon so you can get a print copy minus the price of the PDF. 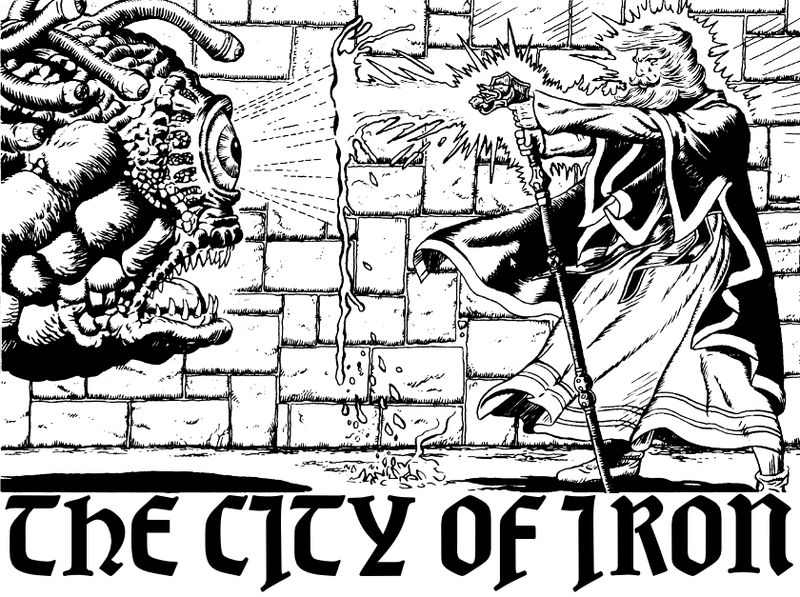 The first book in the B/X Essentials line, Core Rules, is out! Right now, only the PDF edition is available, but fear not: print editions are coming soon! People who purchase the PDF edition now will be sent a voucher to upgrade to the print edition, when it becomes available. Click here to buy B/X Essentials: Core Rules at RPGNow. Additionally, a plain text edition of the book is available online as a google doc and here as PDF / RTF files. The plain text edition is provided as an aid to others who wish to create their own house rules documents or retro-clones (please read the Open Game License, at the end of the document, carefully! ).